A self-avowed “white civil rights” activist was found guilty of malicious wounding Tuesday for his role in the beating of a black man at last summer’s Unite the Right rally in Charlottesville, Virginia. 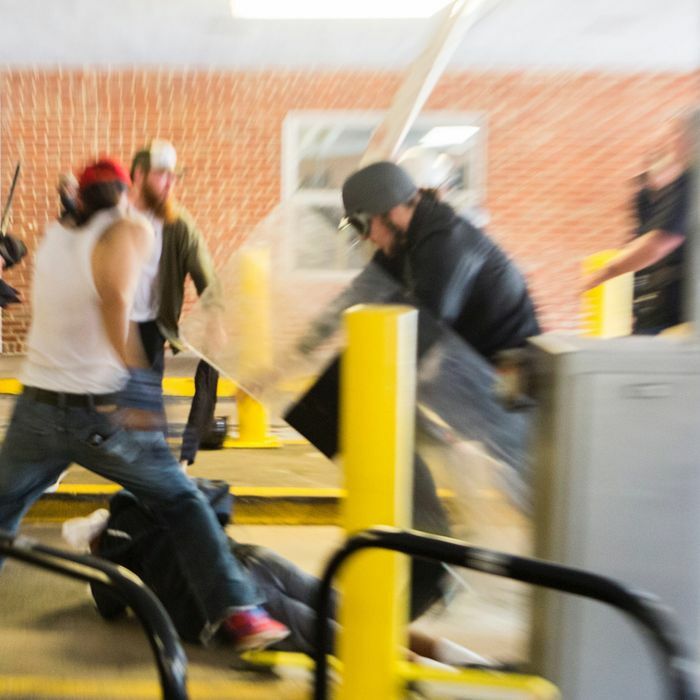 The newly published image above shows Jacob Scott Goodwin, who argued that he was defending himself, holding a shield and attempting to strike DeAndre Harris, who is on the ground. The jury didn’t buy his story and it’s not hard to see why. The beating left the 20-year-old Harris with a spinal injury, a broken arm, and cuts to his head that required eight staples. Video of the attack went viral in the days after the rally and internet sleuths helped identify some of the men beating Harris, including Goodwin. Goodwin argued that he was the victim. He said he “was terrified” of Harris, who struck another white nationalist in the head with the flashlight just before he was attacked. Harris, who was acquitted of assault and battery charges in March, then fled into a parking garage where Goodwin said he became afraid.